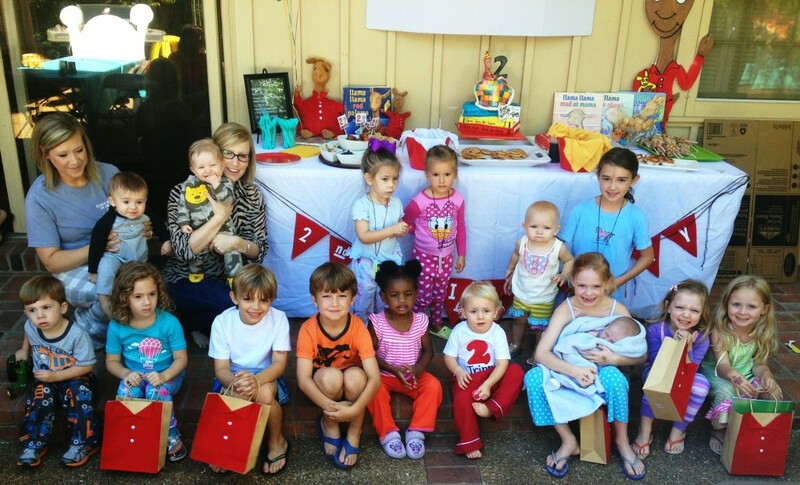 We decided to celebrate our son's 2nd birthday with breakfast and all of his friends in their jammies! A 10 o'clock party is perfect for this age...you're wrapping up the festivities right at nap time! Plus we based the party around our son's favorite book...Llama Llama! Llama Llama Red Pajama (along with all the other Llama Llama books) has been our little man's favorite book for quite some time, so we decided to make that the theme of his 2nd birthday! I tried to do as much as possible for this special event, from the 3' Llama on the table, to the pajama party favor bags. I also designed/printed the invitations, which turned out really cute! If you take you time and do a little here and there, it won't overwhelm you! I didn't really have one favorite thing...I think all the details worked together to make it the perfect party! I haven’t read this book but based on the graphics and the colors, I think it’s worth a trip to the bookstore. Thank you ladies! Andrea – it really is an adorable book series!! Your little one/s will love it! They have board books for much younger kiddos, and regular hardback books for the ones a little older! I want to do this for my daughter’s second birthday next month. What program did you use to create your invitations? I just used Microsoft publisher to make them…if you want, email me and I can send you the file for you to update for your little girl’s party! It’s [email protected]. I just printed them at home on card stock (you print both sides and then have to cut out/fold). Amy, I just saw your invitation three years later– thank you, Pinterest! Would you be willing to send that file to me, if you still have the file? I emailed you at the email provided, or I could give you another email if you would see this first! Thanks for the ideas either way! I love this!! How did you make the bed posts? And what materials did you use? My boy will be 2 in August and he is obsessed with “mama mama”! I think he’s yelling for me, but he’s just wanting llama llama on the tv!